Triple Olives Progressive Jackpot Slot Review - Casino Answers! Triple Olives is a 3-reel, 3-line progressive jackpot slot developed by Cryptologic, featuring a progressive jackpot. 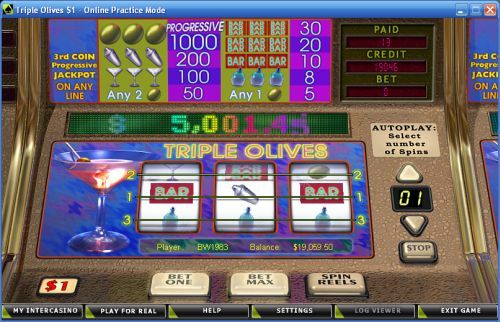 You can play the Triple Olives progressive jackpot slot at [Americans: Unfortunately due to legal restrictions you are unable to play at any of the online casinos this game is at. We recommend you trying playing the unique slots at Win A Day Casino instead.]. Bets on the Triple Olives slot machine are $0.25 and $1. You can select 1-3 paylines on the Triple Olives slot game by pressing the “Bet One” button. Make sure to play all 3 lines to be eligible for the progressive jackpot. You can bet from a quarter per spin up to $3 per spin on the Triple Olives slot game. Triple Olives is an inexpensive progressive jackpot slot that is great for casual players. To play Triple Olives, select your bet and press the “Spin Reels” button or to play the maximum bet and try and win the progressive jackpot, press the “Bet Max” button. Each coin value on Triple Olives has its own progressive jackpot. On $0.25, it is $1,260.90. On $1, it is currently $5,052.60. To win either one of these progressive jackpots, you must play the maximum bet. Land 3 Olive symbols on any one of the three paylines and you will win the Triple Olives Progressive Jackpot when you play at [Americans: Unfortunately due to legal restrictions you are unable to play at any of the online casinos this game is at. We recommend you trying playing the unique slots at Win A Day Casino instead.]! There are 9 winning combinations on the Triple Olives classic slot machine. The complete payout schedule is as follows (payouts in parenthesis): 1 Olive symbol (5), 3 Gin Bottles (8), 3 Single Bar symbols (10), 3 Double Bar symbols (20), 3 Triple Bar symbols (30), 2 Olive symbols (50), 3 Martini Glass symbols (100), 3 Shaker symbols (200), 3 Olive symbols (100), 3 Olive symbols on max bet (jackpot). Triple Olives has a basic autoplay mode that can you assist you in winning the progressive jackpot. Simply use the arrow to select up to 99 autoplay spins. Once you have selected your desired number of autoplay spins, spin the reels as you normally would. You can stop the Triple Olives autoplay mode at any time by pressing the “Stop” button. Triple Olives is an inexpensive progressive jackpot slot, although the jackpots are modest as well. Still, if you’re able to hit triple olives on the reels, you can take home a very nice win. You can play the Triple Olives progressive jackpot slot when you sign up and make a deposit at [Americans: Unfortunately due to legal restrictions you are unable to play at any of the online casinos this game is at. We recommend you trying playing the unique slots at Win A Day Casino instead.]! Can Americans play for the Triple Olives progressive jackpot? No, players located in the United States of America cannot play the Triple Olives online slot game. For many USA-friendly progressive jackpot slots, please visit Bodog Casino.